This column by Inge Kaul is part of Global Policy’s e-book, ‘The Donors’ Dilemma: Emergence, Convergence and the Future of Aid’, edited by Andy Sumner. Contributions from academics and practitioners will be serialised on Global Policy until the e-book’s release in the first quarter of 2014. Find out more here or join the debate on Twitter #GPfutureofaid. History has never stood still; and it won’t do so either now. After more than six decades of foreign aid, it is not surprising that change is becoming necessary and questions of continuing relevance arise. These are signs of progress and development. Therefore, where is the dilemma? That the focus of aid will now have to be on the most fragile and vulnerable countries, is quite obvious. Equipped with decades of practical-political experience and analyses of “what works”, why would such a re-focusing be worrisome? The least-developed countries are precisely those that need external support most. In fact, the current, evidently somewhat unsettled situation of aid presents a major opportunity: It makes it easier to break out of the conventional – and, by now, largely constraining – aid mold and to begin the elaboration of a theory and practice of global public policy (GPP). 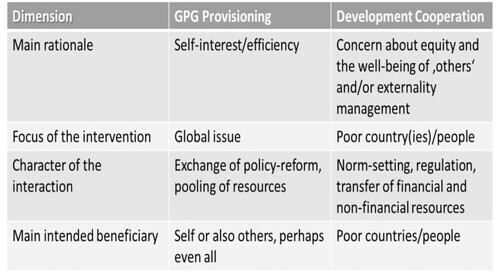 The objective strand of GPP would be about how global, transnational policy outcomes are being generated; and its normative strand would analyze what these outcomes ought to be and how to approach and generate them, if they were to comply with certain normative expectations or requirements. GPP’s added value would be to clarify: first, the differences, as well as the synergy, between the provisioning of global public goods and development support; and, second, the implications of today’s global policymaking realities for global public policymaking in either of these issue areas. Whether people live in developing or developed countries, and whether they are, rich or poor, female or male, old or young, their well-being depends on private goods (e.g. food or clothing), as well as on public goods (e.g. peace and justice, the control of communicable diseases, or sustainable economic growth). As a result of globalization, many formerly more nationally provided public goods have been globalized: turned into global public goods (GPGs). Given that, in order for GPGs like ‘climate change mitigation’ or ‘financial stability’ to emerge, it is often necessary for certain policy actions to be taken in many, if not all countries, it follows that, in such cases, no state, however powerful, can self-provide these goods. Rather, their adequate provisioning requires effective international cooperation. Therefore, it is important to realize that, in many global issue areas, international cooperation is in one’s own enlightened self-interest – and no longer just a matter of foreign affairs or moral and ethical concerns. Moreover, deepening policy interdependence coincides with a trend towards multi-polarity and rising expectations on the part of a growing number of countries of fairness and justice in international cooperation. Yet, as the lengthening list of unresolved global challenges indicates, effective international cooperation today appears to be in short supply. A major reason is that, only all too often, GPG provisioning still relies on conventional aid approaches and instruments. As a result, hierarchy, perhaps even power politics persist where mutuality of benefit should characterize multilateral relations; short-term and small-scale aid is being offered where longer-term investments are required; and compassion is being shown where ‘getting the price right’ would be the more appropriate way of dealing with financing issues like, for example, the issue of compensating countries for the most valuable global service of reducing greenhouse gas emissions – beyond what they would do, if they were to follow just national interests. Therefore, it is high time to recognize that, on the negotiations side, as well as on the operational side, of international cooperation we are facing a dual agenda: the provisioning of development support or aid and the provisioning of GPGs; and that neither just compassion nor power politics but global fairness and justice are required for the effectiveness of both. Public policy within the national context tends to differentiate between the efficiency branch, which is concerned with the provisioning of public goods, and the equity branch, which is concerned about helping society to realize such goals like allowing all to lead a decent human life. However, this distinction does not imply that policymakers can forget about equity, when addressing public-good concerns or efficiency considerations when, for instance, dealing with social security issues. Much the same holds for the international extensions of these two public-policy branches. Take, for example, the case of the “multilateral trade regime”, a global regime that qualifies as a GPG, because it is designed to be globally public in acceptance (or, as economists would say, global-public in consumption). As we have seen in the past, this regime can be shaped so that it generates high net-benefits for some and costs for others. Building equity into the design of international regimes can, in fact, often achieve a lot more for poverty reduction and do so in a more durable way than aid would. The reason is that aid can be volatile and fickle. Yet, international norms and standards, once agreed, will be relatively stable. In addition, past experience suggests that fair cooperation deals might also be the more effective and efficient ones, because they will encounter less reneging and avoidance than those that some parties perceive as having been imposed and running counter to their interests and preferences. Thus, global fairness can have advantages for all the concerned parties. Also, under conditions of economic openness, even development sometimes assumes GPG dimensions. In order to foster effective international cooperation, it is important for countries that hold the key to resolving a global challenge like communicable disease control to possess requisite national policymaking capacity. Therefore, national capacity-building and development more broadly will often be important building blocks of GPGs. Therefore, it could be detrimental to both, GPG provisioning and development to confuse these two international cooperation strands by, for example, tapping official development assistance (ODA) funds for the provisioning of GPGs. Of course, ODA could be used in order to support the contributions that developing countries would like to make – in line with their own national priorities – to particular GPGs. However, if the issue at stake is, for example, one of “climate-proofing development”, i.e. an issue for which the industrial countries have a certain primary responsibility, it would be more appropriate to provide new and additional funds, i.e. to top up ODA with climate finance – rather than taking climate finance out of ODA. In order to approach each of the cooperation strands in its proper way, we need to clarify more precisely the differences between GPG provisioning and aid so that each works more effectively and, thus, also better reinforce the other. Some of the differences that matter are listed in the table below. As a first step, it would be useful to introduce in addition to the existing organizational criteria – e.g. the geographic criteria like country and region, or the economic-sector criteria like agriculture or health – a “global issue” criterion. This would remind us that most global challenges require multi-level, multi-sector and multi-actor, including multi-state, public and private interventions and, because of this complexity, their own issue-specific management, nationally and internationally. Such an organizational reform would also be conducive to overcoming the foreign/domestic divide that today often impedes an adequate GPG provisioning. In fact, reality already seems to be pressing into the GPP direction. Just think of the traction that the concept of GPGs is beginning to find or of the more frequent stalling of negotiations due to a perceived lack of fairness – fairness of process, as well as fairness of outcome. Reality is waiting for us, the international-cooperation community, to recognize and respond to these changes. The “donors’ dilemma”, if one exists at all, is a low priority issue compared to the global prisoners’ dilemma that we could be facing, if we continue muddling the GPG and aid agendas and allow the lengthening list of unresolved global challenges to exacerbate and assume ever more serious crisis proportions. The challenge, thus, is to put aid in its proper place: into the broader GPP framework, next to but distinct from the rapidly growing strand of GPG provisioning. Inge Kaul is adjunct professor at the Hertie School of Governance, Berlin, Germany. From 1989 to 1994 she was the first director of UNDP’s Human Development Report Office and from 1995 to 2005 Director of UNDP’s Office of Development Studies. She is the lead editor of Providing Global Public Goods; Managing Globalization and The New Public Finance; Responding to Global Challenges (published by Oxford University Press, New York, 2003 and 2006, respectively).